Bob Nelson recently loaned me a collection of posters of folk music concerts in Seattle in the early 1950s. I posted them on the web site of the Pacific Northwest Folklore Society. 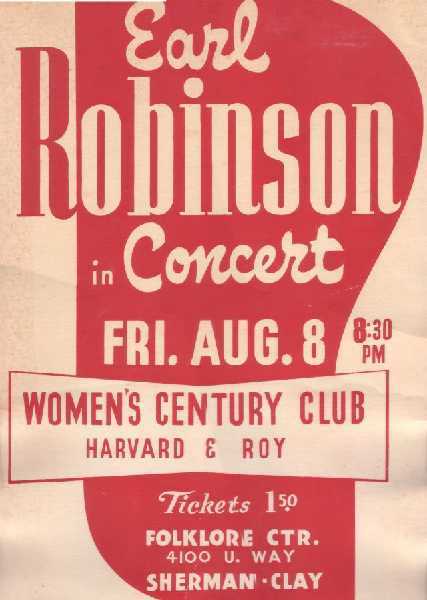 One of these posters caught my attention – Earl Robinson, in Concert, Friday, August 8, 1953, at the Women’s Century Club, Harvard & Roy, Seattle. It seemed I should know who he was, but I really didn’t. On May 28, 2010 the Mayor of Seattle, Mike McGinn, proclaimed the day "Earl Robinson Appreciation Day to celebrate the occasion of the 100th anniversary of his birth and encourage all residents to celebrate the life of one of our most creative and distinguished citizens." 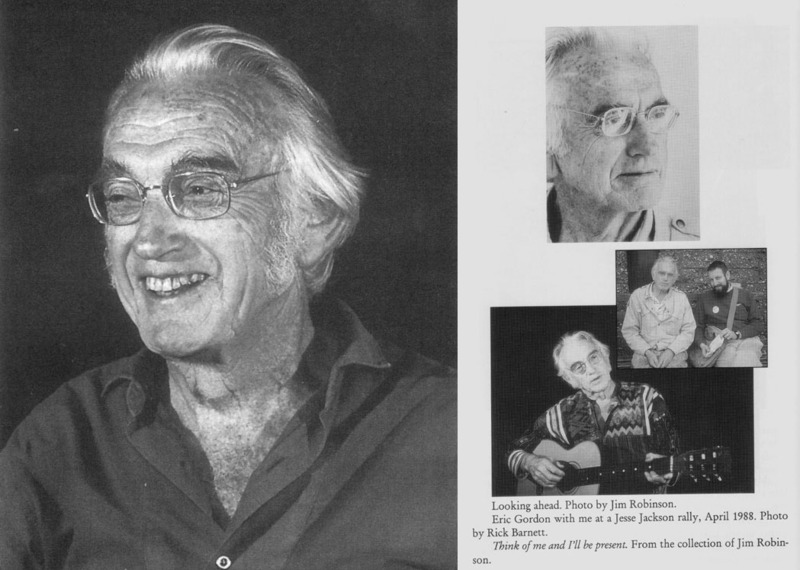 Of course his actual birth date was July 2, but on May 28, 2010 Northwest Folklife Festival featured a two-hour program on his life and works. The highlight of that was a half-hour documentary by B. J. Bullert - Earl Robinson, Ballad of an American. His son, jazz clarinetist Perry Robinson and his nephew, jazz pianist Greg Robinson were there amd played some of his music. Earl Hawley Robinson was born in West Seattle on July 2, 1910. He studied violin, viola and piano as a kid. He attended West Seattle High School and the University of Washington, where he studied music composition and obtained a Bachelor’s degree in music in 1933. He then traveled to China and worked his way back to the United States as a pianist on an ocean liner. He arrived in New York City in 1934 where he studied with Aaron Copland, and was also involved in the depression-era WPA Federal Theater Workshop. He had leftist-leaning political views, was actively involved in the anti-fascist movement, and was the musical director at the Communist-run Camp Unity in upstate New York. There he wrote the music to the song Joe Hill (sung by Paul Robeson). Says I, "But, Joe, you're ten years dead,"
He remembered clearly the writing of Joe Hill in 1936. "I was directing the music in a left-wing summer camp, Camp Unity near Wingdale, NY. We decided to put on a campfire program of Joe Hill songs. Alfred Hayes gives me this lyric in the afternoon. I went into the tent with the lyric and came out 45 minutes later with the tune. I wanted it that night." He continued to work in the Federal Theater Workshop, and led the People's Chorus at the International Workers Order. In 1939 wrote Ballad for Americans with John Latouche for the play Sing for Your Supper. In this epic patriotic song, the singer paints a portrait of the American people throughout history. Paul Robeson first performed the song on radio in 1939. It was a great success, and was later recorded by Robeson with his American Peoples Chorus. Who are you? America! America! He twice received Guggenheim Fellowships. Franklin and Eleanor Roosevelt welcomed Robinson to the White House in the 1940s while the FBI had him under surveillance for his Communist activities. His Ballad for Americans was the theme song at both Republican and Communist Party national conventions in 1940. And it belongs to fighting people, that's America to me. Because of his Communist associations, Robinson was a victim of the Hollywood Black List from 1948 until his return to films in 1968. In 1952 he composed the folk opera Sandhog. From 1957 to 1966 he chaired the music department at Elisabeth Irwin High School in New York City. He then returned to California where he conducted the Extension Chorus at the University of California from 1967 to 1969. In Hollywood he composed the music for a number of television shows including The Great Man's Whiskers (1972) and the Adventures of Huckleberry Finn (1975). In 1954 he wrote the song Black and White with David Arkin, inspired by the Supreme Court decision, Brown vs Board of Education, that outlawed racial segregation in public schools. The song was later turned into a pop song by Three Dog Night. In 1989 Robinson returned to his family home in West Seattle where he continued to compose abstract compositions. In that year was presented at the Pioneer Square Theatre in Seattle (directed by Lyn Terrell, with Ezra Buzzington, Suzanne Irving, Victor Morris, Nancy Nolan, Gwen Overland, Wesley Rice, and Earl Robinson). Joe Adcock, of the Seattle PI, wrote in his review: "Elegantly turned-out songs of hope, courage, loyalty, humor, justice, gratitude and generosity are worth celebrating. A rebirth and renewal of these qualities is passionately to be desired. And two hours of effective adult entertainment that doesn't exploit hatred and fear is a rare and joyous experience." In a videotaped interview in 1990, he said, "I would like to be remembered as a composer of good songs – songs that help people." On the evening of July 20, 1991, Earl Robinson was killed in a head-on auto collision on Southwest Admiral Way in West Seattle. 2. Earl Robinson [videorecording]: Ballad of an American; a documentary produced by Bette Jean Bullert in conjunction with KCTS Television, Seattle, 1994.